I really like how you rendered this in 3D Cad, can you name the program? Also, this design is my favorite, but I’m thinking I might do it with vertical walls. Is there a specific benefit to the tapered design other than less space to heat and cool? All perspective drawings are in SketchUp, Google’s free drawing program. 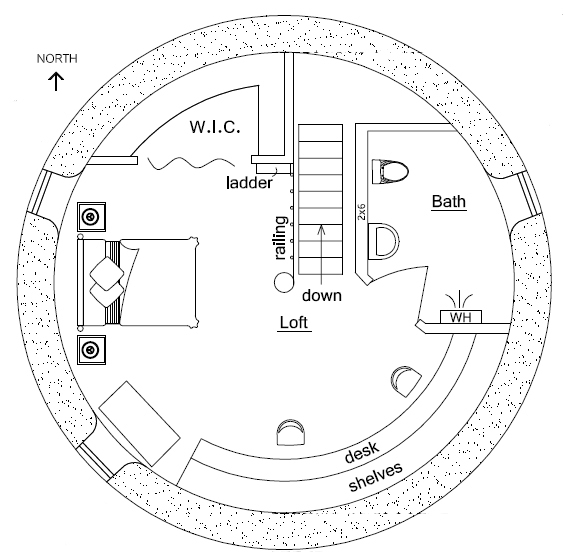 It would be easier (and more practical in some ways) to build a two story roundhouse with a roof. I’m just trying to push the limit a little and come up with something unique. One of the main advantages of towers is their excellent wind resistance. First I must say I am impressed with the work you do. It is very inspiring. A lot of people in developing countries are stuck with using imported building materials which is very costly. I am interested in buding this design in Africa. How big can it be? I like this designe because it has the bedroom upstairs but I would like to make the 2 bedrooms or 1 bedroom and another office. Really, you do incredible designs. I just wish there were a way for an American to actually build and live in one. The Government is just way, way out of control… It costs to get ‘permission’ to not be homeless, ‘permission’ to do work, it never ends. Paying for nothing. Thailand is nice, but it’s nearly impossible to become a citizen, and only citizens can own land. Only the wealthy need apply…. So why even bother? If you’re rolling in that much cash you can just stay in the USA. I’ve put a lot of effort into calling Counties in various States in the USA, but can never get a straight answer out of any bureaucrat. There is really no way to know what they even ‘allow’ and how much you have to pay to get permission to be not homeless. Unless I move to Africa, which I also cannot afford, there is no way I will ever be anything but homeless. It’s nice that an engineering firm has decided to work with your plans, but the cost is still exorbitant. Consider that, having to move to Africa from the USA to avoid homelessness… Pathetic. I know what you’re saying and agree 100%. The current system is out of control to the point that billions can’t build their own home. That’s why I’ve spent a large part of my life looking for loopholes, low cost building methods, etc. so people have more choices. Instead of calling building officials and getting evasive answers, I would search out counties of interest to you (climate, geography, etc.) that have been recommended by others. Thousands of people have found places where they can skirt the codes. Now you need to find these people and look for land in that general area. Also realize some areas say “yes we have codes”, but in actuality all they enforce is the septic system or the electrical and plumbing. I know you can find lots of places to build in the US if you’re willing to relocate to rural areas in places like Nevada, Texas, Colorado, Missouri, etc. Another good approach is to buy cheap rural land with a trailer house or old farm house that already has electric and septic, and later build an “out building”. Wink wink, got it? Mexico, Central and South America are all popular places. And no, you don’t have to be rich. I’m not. Consider long term leases or building something very low cost with a friend. If things don’t work out after a few years then just move on. You’d only lose $2,000 or so. Remember there are no guarantees in life, so don’t worry. Just keep trying and things will work. Yes, but you’re Doctor Dirt! Compared to me, Mr. Unemployable. Even if money were not a consideration, you have far more opportunity than I do. Clout, etc… I’m some homeless guy that everyone hates because I think that living in a house made of dirt is a good idea. I’ve considered the Americas below me, but I have no people there. Rural/Isolated is exactly my style. But even such land, when cheap, is heavily regulated to the point that it really isn’t cheap even when it’s $500/acre. Well: $20,000. Permits: $45,000. On $500 of land? WTF? Many thousands of people are living like this — remote rural locations, off grid, low tech, simple lives. It’s not an easy life but it can be done. I found his website years ago. Hi Owen, been following your work and site for some time now. getting close to making my project a go. This plan idea has always been on the top of my list. I live in Arizona and have the land. Its a very dry/windy climate with spectacular views. I would like to build a small tower like this however. My only concern is here though 2 story building is often done, its not a very smart practice because of the heat and cost to cool. 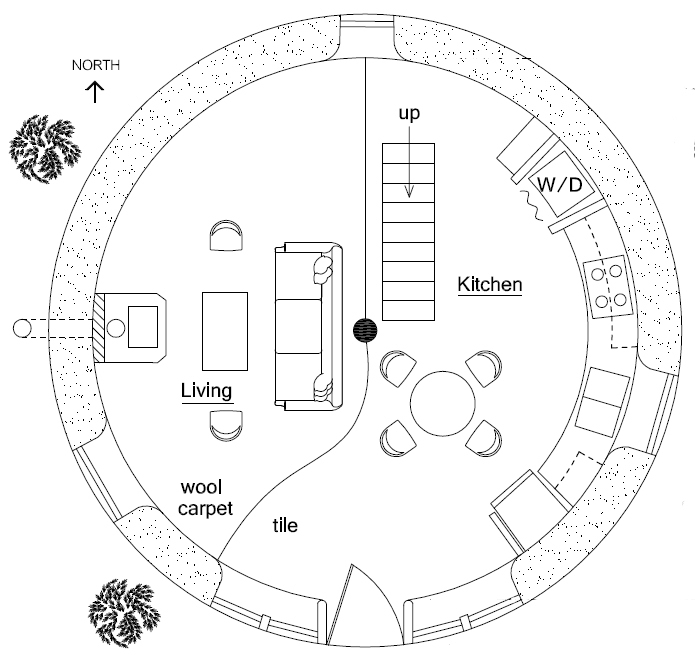 Though earthbags will have a greater impact on reducing the cost to cool, i must still consider some sort of room or central cooling unit and the 2nd story(on a tapered wall) will prove problematic. I know i can be creative here and start with a survival shelter idea, and build a single story on top. Ideally what im thinking is a basement, to single story that has roof access for a deck/patio on top. To maximize those views on a cool evening. No problem, Shain. The roof can be changed to a flat roof. Email me at strawhouses [at] yahoo.com and we’ll work out the details. I haven’t gotten to the fortified tower house yet. I do have a blog post ready about fortified earthbag structures coming out in the next couple of days. I am totally interested in the tower house or something round with a top deck. In Lake County California a California Licensed Civil Engineer must prepare the construction plans. Will your plans meet those requirements? I looked at that site.. can you tell me approximately what I could be looking at as their fee? Is it several thousand dollars is what I am wondering? Email them for a free quote. I think it’s around $2,000. Thank you and I will do just that. I’m hoping to build an earthbag home this year. 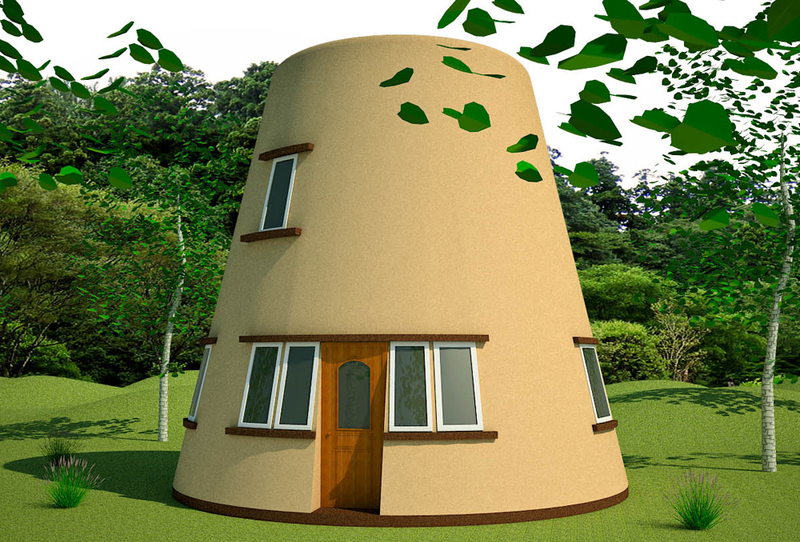 I really like this design (tower house) and also the peace dome. I was wondering on this design-how tall is the tower? What is the roof made of? Do you think that the tower house would be a lot more complicated to build than the peace dome? The Tower House is 23′ high. There’s a waterproof deck that can be made with various brands of products. Search online for waterproof deck products. The Tower House would be more difficult than the Peace Dome because it’s labor intensive to raise heavy soil high in the air. You could build it with bags of scoria (lava rock) and greatly reduce the labor. Search our Natural Building Blog and other sites for extensive information about building with scoria.